When it comes to the materials used in your showers, you’ll have plenty of options to choose from as well. But what we've found is that the majority of universities are discovering that solid surface showers are the way to go. Over the course of our more than 20 years in the industry, we’ve become pretty familiar with the reasons why this is. So let’s take a look at a few reasons why universities choose solid surface over other materials. A sometimes overlooked, or under-estimated, piece of a university bathroom project is the ongoing maintenance required to keep showers safe and clean. While a lot of other materials will require regular re-grouting and sealing, solid surface showers don’t. Cleaning solid surface showers is a simple process that usually only requires some soap and warm water. And forget about mold and mildew, solid surface material is non-porous, which means it is resistant to harboring bacteria or mold. When you have thousands of students using these showers, keeping them safely intact and germ-free is an absolute must. Your project is different than any other project out there. Maybe you have a uniquely designed space that requires a uniquely designed shower stall or base. Solid surface is one of the few materials that give you the options of customizing it to your needs. It allows for flexibility in design with customizable shapes and sizes of not only the shower bases, but also the shower walls and other aspects. Pan sizes, drain locations, style of entry, and even fittings can be completely customized to your needs. Some options, such as tile, can be difficult to install. There can be a considerable amount of prep work, and you’ll most likely need to remove existing pieces before starting. Solid surface can be installed over some existing structures, so creating shower walls, surrounds, and bases can be a much quicker process, which can save a lot of time and effort. Not to mention, this can lower your total upfront costs. We’ve touched on the decreased ongoing maintenance and care with solid surface showers, but there is also the fact that they’re extremely durable. And let’s be honest, the more durable the shower area is, the safer students will be. There’s nothing like having a student get scraped or cut from a gouge in a shower base, crack in a shower wall, or that loose tile. Universities want a tough, long-lasting, resilient material, and that’s why more and more are turning to solid surface to get the job done! Solid surface is strong, easy to maintain, and built to last. 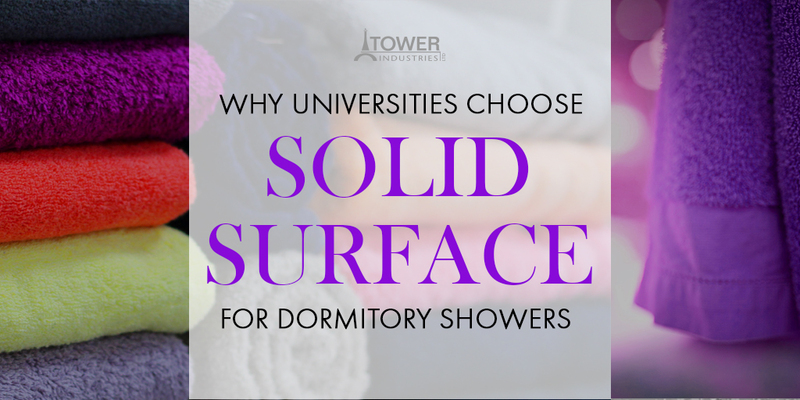 Universities have a wide variety of options for residence hall showers, but you’ll find that solid surface comes out on top by providing a safe, easy to maintain, customizable solution that is built to handle a high level of use for a long time.